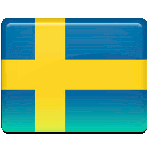 December 23 is an official flag day in Sweden. This day honors the birthday of Queen Silvia, the reigning queen of Sweden. Queen Silvia of Sweden was born on December 23, 1949 in Heidelberg, Germany, as Silvia Renate Sommerlath. She held a position at the Argentine Consulate in Munich and was an educational host during the 1972 Summer Olympics. She met then-Crown Prince Carl Gustaf during the Summer Olympics in 1972 and, as the King explained, something “clicked” when they met. Gustaf and Silvia announced their engagement on March 12, 1976. The wedding took place on June 19 in Stockholm Cathedral. The marriage ceremony would have been organized earlier, but in this case Carl Gustaf would have lost his position as heir-apparent to the Swedish throne. His grandfather King Gustaf VI Adolf believed that the royalty must marry only royalty. Queen Silvia is much loved in Sweden. She is involved in different charity organizations, mostly the ones that deal with disabled children and children-victims of sexual abuse. She organized a fund that helps children at risk and it operates in 17 countries.